Contact: prof. RNDr. Petr Hliněný, Ph.D. and prof. RNDr. Daniel Kráľ, Ph.D., DSc. 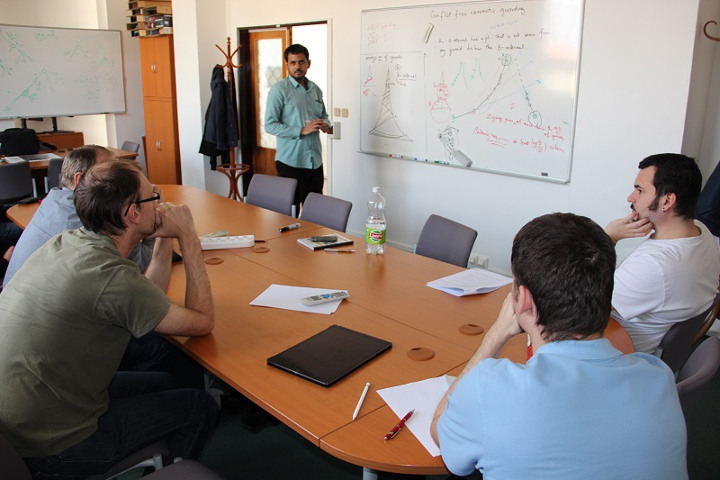 The Laboratory of Discrete Methods and Algorithms (DIMEA) focuses on problems from discrete mathematics underpinning computer science and their applications to the design of discrete algorithms. Our research areas include in particular algorithmic, geometric, structural and topological graph theory, and analytic representations of large discrete structures. The members of the laboratory have an intensive network of collaborators (e.g., they coauthored papers with more than 150 researchers), and their research is supported by various national and international grant agencies. The laboratory welcomes all students of the bachelor, master and doctoral levels to participate in its research seminars and to join its research activities. Responsible contact: prof. RNDr. Daniel Kráľ, Ph.D., DSc.